On 14 November 2013 the U.S. DoE’s Office of Fossil Energy approved LNG export authority for a company located next to the end of the Transco-Sabal Trail-FSC pipeline in Martin County, Florida, right where FPL is already building another pipeline to the sea. All the time since then Spectra and FERC have been saying the Sabal Trail pipeline is not for export. FERC’s whole rationale for federal eminent domain for this pipeline is that Florida needs the power. If the methane is really for export, what excuse is there for federal eminent domain? Friday 15 November 2013, the next day after that LNG authorization, all three of Sabal Trail, Florida Southeast Connection (FSC), and Williams Transco’s Hillabee Expansion Project filed their updates with their Draft Resource Report 1: General Project Description and Draft Resource Report 10: Alternatives. 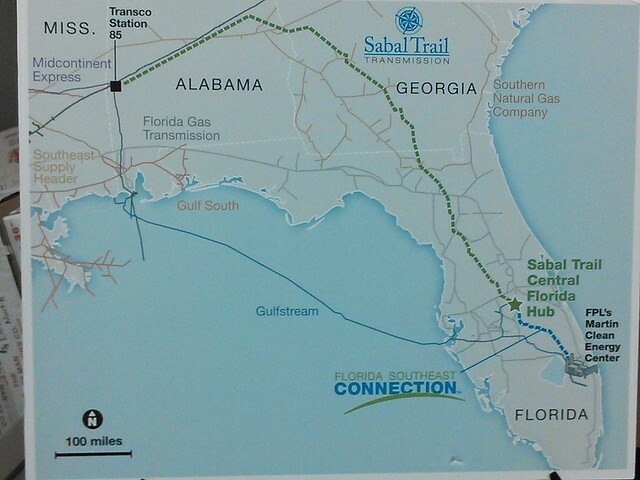 Sabal Trail’s RR10 is the one with the laughably bad misinformation about solar power, which actually by Sabal Trail’s own acreage numbers would take less land than this pipeline project to produce the same amount of power. And already there was an export authorization for Florida, making the very first thing that RR10 should have proven equally laughable: that the methane was for Florida! Given that Spectra is building a pipeline to export through a liquid natural gas (LNG) terminal in British Columbia, and FERC has before it around a dozen requests for new LNG export terminals, and that two LNG terminals, so far marked as for import, were being permitted in Florida, one of which, Port Dolphin near Tampa, was already permitted by FERC [for import]: Is this pipeline for LNG export? Peconom said Spectra had not given that reason to FERC. 9 December 2013, Spectra didn’t indicate they knew anything about LNG export at the Lowndes County Commission, Georgia. December 2013, during the entire series of FERC-required Sabal Trail Open Houses in Alabama, Georgia, and Florida, nobody with Spectra mentioned this export authorization. 27 January 2014, John Peconom of FERC was present at the Moultrie, e-do Open House in Colquitt County, Georgia, but neither he nor Spectra said they knew anything about export. 20 February 2014, when the Gilchrist County Commission, Florida, interrogated Spectra for two hours, neither Spectra nor their gaggle of experts said a word about this export approval. March 2014, at none of the FERC Scoping Meetings have I heard that FERC or Spectra mentioned this export approval. 5 March 2014, at the Scoping Meeting in Moultrie, GA, FERC admitted that it’s not the pipeline company that has to file for export; it’s the customer. At one of the Scoping Meetings in north Florida last week, FERC once again said that the pipeline company doesn’t have to file for export; it’s the end customer that has to do that. Not once during the four and a half months since 14 November 2013 did FERC or Spectra ever mention, so far as I’ve heard, that a Florida LNG export facility was already approved! And the approved LNG export facility is in Martin County, Florida. That’s the county at the end of the Florida Southeast Connection (FSC) pipeline, which connects to Sabal Trail, which connects to Williams Transco. Specifically, FPL requires FSC to connect to FPL’s Martin Clean Energy Center in Martin, County, Florida, 27.053°N 80.550°W, on SW FP&L Access Road, Indiantown, FL. AES states that a contract currently is under development for ABS to purchase LNG from BP Energy Company (BP) at the planned Floridian Natural Gas Storage Company, LLC (Floridian) facilities in Martin County, Florida. According to AES, the Floridian facility is not yet constructed, but it has been approved by the Federal Energy Regulatory Commission (FERC) and is planned to be operational by the end of 2015.3 AES states that BF will own firm capacity for the liquefaction, storage, and truck loading of LNG at the Floridian facility and will sell LNG at the outlet of the Floridian facility to firms such as AES. The Floridian Natural Gas Storage Project would be constructed 2 miles north of Indiantown in Martin County, Fla., and consist of an LNG storage, liquefaction, and vaporization facility. It also would include 4.2 miles of 12-in. incoming pipeline and 24-in. sendout pipeline extending from the storage facility to the Gulfstream and Florida Gas Transmission interstate pipelines, and a 2¾-acre metering and regulating station. 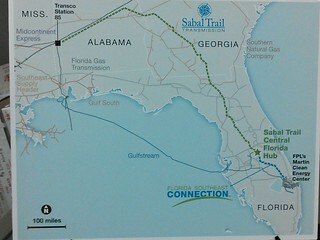 Gulstream and FGT are the two existing pipelines Sabal Trail is required to connect to south of Orlando. And with Sabal Trail connecting to FSC all the way to FPL’s Martin County project, which itself is about two miles north of Indiantown, Martin County, Florida, The Floridian Natural Gas Storage Project won’t even need those feeder lines to Gulfstream and FGT. I suppose Sabal Trail or Spectra or even FPL could try to argue they didn’t know this. But why wouldn’t their own Williams Transco partner have told them, given that a former Transco official is a principal of the Floridian Natural Gas Storage Project, according to that 2008 news story? The more than $500 million project’s sponsor is Floridian Natural Gas Storage Co. LLC (FNGS), a joint venture whose principals include J. Bradley Williams, a former Transco Energy Co. and Mobil Corp. official, and David W. Sharp, a former executive with Shell Oil Co. subsidiary Coral Energy. Warburg Pincus and Co., a private energy equity investor, also is a partner. Mr. Williams returned to the natural gas arena with FPL Group in 2003 to help bring new gas supplies to Florida and pursue natural gas opportunities on the unregulated side of FPL Group outside of Florida. Mr. Williams left FPL in early 2006 to work with a variety of companies and to pursue the development of the Floridian Natural Gas Storage Project. AES states that it will transport the LNG from the Floridian facility within the United States over highways and/or via rail, and will transport LNG to buyers in Central America and the Caribbean using approved ISO containers transported on ocean-going vessels. AES states that it will export the LNG to its customers from the Port of Palm Beach. That’s about 40 miles by road from FPL’s Martin County power plant. And about 6 miles from FPL’s headquarters in Juno Beach, Florida. As part of the Riviera Beach Next Generation Clean Energy Center modernization initiative, FPL is modifying the project’s certification in order to construct a new fuel pipeline to the site. This new pipeline will ensure that a reliable source of natural gas is available year-round to serve this highly efficient new energy center…. The pipeline will start near FPL’s Martin Clean Energy Center located in northwest Indiantown. It terminates at the western end of FPL’s Riviera Beach pipeline located at the intersection of Florida’s Turnpike and State Road 710 in West Palm Beach. Construction on the pipeline will take approximately one year. Plans are to start construction in early 2013 and be completed in early 2014. Riviera Beach is also one of the three gas plants mentioned in the Tampa Bay Times 24 October 2013 story about the Florida PSC “tentatively” approving Sabal Trail and FSC. The other two are at Cape Canveral and Port Everglades, so that’s three Atlanta coast end-users associated with Sabal Trail methane. Plus the same Tampa Bay Times story mentioned Duke Energy wants Sabal Trail methane for its Crystal River Plant, and the Sabal Trail maps include a Citrus County Pipeline that goes right there, so that’s a Gulf coast potential export location, and then there’s Port Dolphin near Tampa. But nevermind potential. Here we have documentation of the whole pipeline path through Alabama, Georgia, and Florida to LNG export through the Port of Palm Beach, Florida. So the three-part pipeline FERC has been telling everybody has nothing to do with LNG export leads to an approved LNG export seaport. Somebody please tell me if I have any of this incorrect. If it is correct, somebody please tell me how Spectra and Sabal Trail and FPL and FERC possibly could not have known this ever since 14 November 2013? When FERC had previously approved the same company for LNG storage? When someone who previously worked at both Transco and FPL is the first principal listed by Floridian Natural Gas Storage, LLC? When that facility is exactly where FPL is building a pipeline to the sea? When that seaport is half a dozen miles from FPL’s headquarters? Now that everyone knows, how can FERC possibly justify eminent domain to take land from people in Alabama, Georgia, and Florida to export fracked methane to profit a few fossil fuel companies?